Imagine a perpetually sunny destination with more than 700 islands and 2,000 small cays, surrounded by miles of crystal-clear water, and its easy to see why it can truly be better in The Bahamas, especially when winter temperatures arrive. Stretching more than 750 miles across the Atlantic Ocean, one end of the island nation lies just 40 miles due east of Palm Beach and the other is just 70 miles north of Haiti. Most of the tourism has been concentrated on the main destinations of New Providence Island (including the captial of Nassau and nearby Paradise Island) and Grand Bahama (Freeport, Lucaya, and much more). 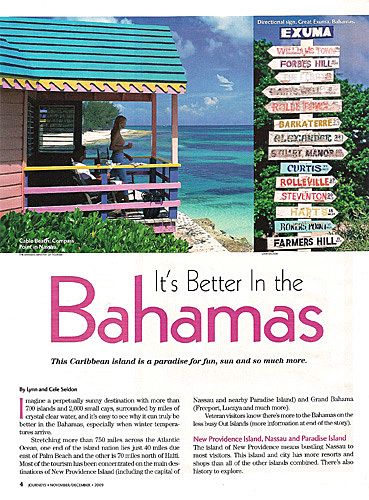 Veteran visitors know there's more to the Bahamas on the less busy Out Islands (more information at end of the story). The island of New Providence means bustling Nassau to most visitors. This island and city has more Bahamians, resorts, and shops than all of the other islands combined. There's also hsitory to explore. A stroll through Old Nassau provides a slow-paced exploration of history on New Providence and in The Bahamas. This port city's fascinating past is best seen by foot. The best place to start a walking tour of Nassau is at Rawson Square and the Ministry of Tourism Reception Services Office. Most visitors start their stroll right at the modern cruise ship port, known as Prince George Wharf, where many cruise ships will likely be docked. Here, theres also the Hairbraiders Centre, where tourists with varying lock lengths have their hair braided. Rawson Square is at the foot of the dock. The squares main feature is the Churchill Building, where several government officials have offices. Theres also a statue of Sir Milo Butler, the first governor of The Bahamas after the islands gained independence in 1973. The waterfront walkway to the west is known as Woodes Rogers Walk, the street named for the first British governor of The Bahamas. Eventually, it leads to the infamous Straw Market. Before heading that way, look for Parliament Square just behind Rawson Square. This busy square includes a statue of young Queen Victoria, as well as the Senate Building, the House of Assembly and the Supreme Court. With much more than just handmade straw souvenirs, a visit to Nassau's Straw Market has to be one of the most unique shopping experiences in The Bahamas. Behind the Straw Market at George and Bay Streets, look for the Vendue House and the Pompey Museum. This 18th century building served as a slave market until the Emancipation Act of 1834. Up Market Street from the Straw Market, be sure to visit the Balcony House, which was built by ships' carpenters in the late-1700s. It now houses an interesting local museum, a staircase from a ship, slave kitchens, and three other historic houses. Further up Market Street, Gregory's Arch spans the road. This pretty arch, built in 1852, marks the entrance to Grant's Town, one of the earliest settlements of former slaves and their ancestors. Nearby, you can take a peak at the pretty pink Government House and marvel at the Christopher Columbus Statue, here since 1830, commemorating the New World arrival of Columbus in The Bahamas. After visiting the museum, take a right on Elizabeth Avenue and head up the Queen's Staircase. These steps were carved out of limestone by slaves for a quick route to Fort Fincastle at the top of the hill. Each of the 65 steps supposedly stands for a year of Queen Victorias reign. Fort Fincastle was built in 1789 and has a commanding view of the harbor. The rest of New Providence Island offers plenty of beaches and a wide range of resorts, plus world-class diving and snorkeling out of several dive shops. Of course, casinos are also a draw at several resorts. Located north of New Providence Island and closer to the United States, Grand Bahama Island features an array of world-class resorts in or near the twin towns of inland Freeport and the south shores Lucaya. Along with the requisite resorts, casinos, beaches, and shops (Lucaya has a great straw market), Grand Bahama is also known for great golf, superb snorkeling and diving, other watersports, and eco-tourism opportunities encompassing two national parks and other preserved parts of the island featuring the lush natural forest. *Abacos--Stretching for more than 125 miles to the east of Grand Bahama, the Abacos (especially Great Abaco and Little Abaco) are among the more developed of the Out Islands. *Andros--Its the largest Bahamian island, but its quite undeveloped, just the way visiting anglers and divers like it. *Berry Islands--Located between Bimini and New Providence, the town of Great Harbour is classic Out Islands. *Bimini--situated close to the Sunshine State, but in another world, Ernest Hemingway loved being on Bimini or offshore in a fishing boat. *Eleuthera--With stunning beaches and varied resorts, Eleuthera and the islands of Harbour Island and Spanish Wells are well worth a visit. Harbour Islands historic Dunmore Town is great for strolling. *The Exumas--Again, great boating and fishing are the lures in the Exumas, as are the village of George Town and the protected areas of the Exuma Cays Land and Sea Park. *Southern Bahamas--The remote islands of the Southern Bahamas are mainly made up of Cat Island, San Salvador, Long Island, Crooked Island, Acklins Island, Mayaguana, and Inagua. In particular, Long Island and San Salvador are known for diving.